Made of soft, durable berber. 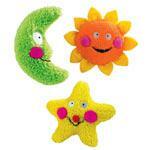 Cute and soft with big smiling faces that will give your dog lots of enjoyment! Each includes a squeaker for extra hours of fun and excitement!!!! Make play time and training time FUN!!! Cute, soft, cuddly, berber toys.